Tegucigalpa - International organisations express our concern about the persistent negligence of the Honduran authorities during the process of the investigation of the murder of Berta Cáceres Flores and the attempted murder of the defender Gustavo Castro. In this sense, it is reprehensible that, two weeks after the beginning of the oral and public trial regarding some of the involved, the Prosecutor's Office has not analyzed the fundamental evidence for the investigation and also continues to violate the victims' access to truth and justice. 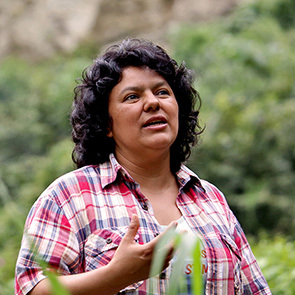 We urge the Honduran authorities to immediately rectify their actions and we recall that the murder of Berta Cáceres Flores exemplifies the violence and impunity faced by human rights defenders in exercising their work in this country. The State of Honduras has the obligation to investigate these cases promptly, exhaustively, independently and impartially. The Public Ministry has had in its possession since May 2016 a series of articles that were confiscated during raids on the homes of the accused and the offices of the company DESA, such as mobile phones, USB drives, cameras, electronic tablets, mobile phone chips, removable hard disks, computers and even weapons and bullet shells. However, 2 years later the Ministry maintains that these devices have not been the object of expert examination, which means that there has been no diligent investigation and that there is a risk that the mere passing of time may have damaged the evidence. This situation was recently communicated to the Public Ministry, despite the numerous steps taken by the Consejo Cívico de Oganizaciones Populares e Indígenas de Honduras, "in English Council of Popular and Indigenous Organizations of Honduras" (COPINH) and the family of Berta Cáceres. Up to now the Public Ministry has denied the victims access to the information on at least 35 occasions and, although the Tribunal de Sentencia con Competencia Nacional Territorial en Materia Penal (Sentencing Tribunal with National jurisdiction in criminal affairs) has ordered it to deliver the information on many occasions, this investigative body has blatantly failed to comply with the order without any legal consequences. On its part, the Sentencing Tribunal has not accepted that it considers the COPINH to be a victim in this case, unjustifiably restricting the participation of this movement in the criminal proceeding for the murder of its leader. This series of irregularities, which have been systematically practised, violate the right of the victims to take part in all the stages of the procedure, unjustly limit their access to the information and condition their search for the truth and justice. Given this situation the signatory organisations consider it inadmissible for the procedure to advance without the analysis and submission of all the available information. As maintained by the Inter-American Court of Human Rights, the States must "(...) ensure that the relative (...) have full access and capacity to act in all the stages and instances of the said investigations and procedures, in accordance with internal law and the provisions of the American Convention". Moreover, according to the said High court, the States have "the obligation to remove all the factual and legal obstacles which might hamper the exhaustive judicial enquiry of the violations of the American Convention perpetrated in this case, the judgement of those responsible and the due reparation for the victims". In this specific case, the negligent attitude of the Public Ministry raises serious doubts regarding its real intention to clarify the facts and identify all the responsible parties and, specially, the masterminds involved. Finally, the signatory organisations urge the Honduran authorities to take immediate steps to rectify their actions and would like to remind you all that the murder of Berta Cáceres Flores is an example of the violence and impunity which the defenders of human rights have to face when carrying out their work in this country. The State of Honduras has the obligation to investigate these cases promptly and in the most exhaustive, independent and impartial manner possible.